The young Genin moved at slow pace as he walked down the street of his village. He didn't have a mission, didn't feel like training, and definitely didn't want to be at home, so here he was. He was simply wondering around to find answers. The village was starting to become stale in a sense, with not many ninja coming into the picture. This meant that the ones they had would need to grow stronger. If they showed that strength, they could inspire others to join. However, He didn't exactly inspire awe in the face of his opponents. He was strong for a Genin, but that was it. He needed more, and the only way he could do that was to find someone to teach him. His ideal situation would be to learn from the Kage himself, as he wanted to protect him as an Anbu down the road. Building that trust early would easily allow him more time to absorb some of the power he possessed. Not that his sister was weak, as she was clearly extremely capable as well. He would glance from side to side as he continued to ramble in his own mind. Finding a nearby park bench, he sat down with a sigh, deciding to take a break for a few minutes. He knew he wouldn't get any better sitting down, but he couldn't help his lack of motivation. He really didn't have a clue what he was going to do with his day. Things had been quiet since Jayr had returned from the Kage Summit. She had had a chance to properly meet the new Kage, but otherwise it had been quiet. She had continued to help her mother around the inn they owned while at the same time feeling this nagging sensation in the back of her mind that said she could be doing more but wasn't. Or, perhaps it was that she should be doing more and wasn't. Either way, it was enough to get her away from the inn today and have her wandering down the street. Like usual Jayr's eyes were covered with a cloth, a universal symbol that she was blind in a way. It was true, her eyesight was non-existent, but that did little to stop her given her clans ability. It was weaker than some in her clan, but then stronger than others. It was enough to allow her to move from point A to point B without bumping into too many people or too much stuff. It wasn't long before Jayr found someone sitting on one of the few benches that was her favorite. She had had every intention of smoking some of her medically made drug, but she wasn't entirely sure how the individual sitting there would feel about it - still, she could feel her beastie beginning to stir and that was never good. Jayr wandered over, deciding that instead of sitting on the bench she'd simply sit at the base oof the tree nearby. With slightly shaking hands she would reach into her pack and pull out the kit that held her drug of choice - which resembled a strangely colored herb - her pipe and lighter. Without giving it a second though to how it likely looked to a complete stranger she would pack herself up a decent bowl and then proceed to light up. The first inhale and exhale was glorious: enough to calm her savage beast and stop her from shaking from the sheer fear of such a thing getting loose on a public street. As Hitomu sat there letting his mind ramble, a young lady with a cloth around her eyes wondered over to his area. She would sit down at the base of a tree before pulling out what seemed to be some kind of smoking substance. He watched as she packed a bowl, obviously having done this for some time considering the speed and skill with which she did it. She took a hit and if he could see her eyes, he's pretty sure they were in the back of her head by now. The smell of the stuff wafted over to his bench, which made his nose crinkle. It was not anything he had ever smelled before, but she seemed calm enough. Maybe he should try smoking considering that was part of his abilities. Both of his parents would probably kill him. He was trying to decide whether or not to approach her, but finally stuck with the answer yes. He got up off his bench, wondering over to her position. "Hey, not trying to be nosy, but what is that your enjoying?" He asked, curiosity was always an easy way to start conversation. "I'm Hitomu, by the way. I'm a Genin in this village." He spoke to her but didn't really look at her face. It was a nice face, he just didn't want her to think she was staring. She obviously had some way of knowing what was around her, so she probably knew he was there already. He just hoped this didn't blow up in his face. Jayr was well aware that there was an individual nearby, and even more so that he was moving closer. She had a specific range around herself that she could 'see' by using the earth her bare feet were planted firmly upon. Eventually that range would increase and grow as large as an entire village - if not bigger - but for now she was comfortable with what she had and wasn't going to complain. At least she wasn't completely and totally blind after all. She was asked what she was enjoying only the voice didn't seem scolding or anything, but rather curious instead: it made Jayr grin a bit. Before she could respond he went on to introduce himself as Hitomi, one of the Genin of their village. "I'm Jayr Yanagi...", she would pause, leaving her Senju heritage unknown for the time being. "It's called Chill. My mother, whose a medic, invented it. It's to help with a medical problem that I have..." No need to go into detail that she was a berserker who was liable to turn into a maniac and slaughter any friend or foe in front of her - at least not yet. No, there was no danger at the present moment with a fresh bit of the drug running through her system. She was perfectly calm and relaxed. Absently, Jayr reached up, adjusting the blindfold she used until it was comfortable on her face once more - even stopping to itch at a spot that irritated her a bit. She then brought her bowl to her mouth once more and after a flick of the lighter inhaled more of the sweet smelling drug. Hitomu couldn't help but grin once she started doing it, because he was friendly, he just had no friends. Her name was Jayr Yanagi and she was smoking something called Chill. He pondered on what her condition was, but decided she would tell him when she was ready. Medical problems often got to personal for Hitomu anyway. He decided to walk over beside her and sat on the ground. "I am a part of two clans. The Nara clan and The Funen clan. That means I have Smoke Release and can control shadows. It's a pretty odd combination, but I make it work." He said shrugging at his luck. She seemed nice enough, he just didn't want to talk her to death. He would lean back, getting comfortable before waiting to hear more about this girl. Most people would focus on her lack of sight, but he was more interested about what she did and if she was a genin like him. He wanted a squad, if he was being honest. So the more genin he knew, the better chance of him getting one. "I have a mission in a few days if you want to come too. I don't know what rank you are, but you seem like a ninja with how you can sense my presence without seeing me. It will be something little and tedious, but at least you will get some money." He figured he would be able to get through the small missions with a partner. He heard there was a lot of manual labor involved in D-Rank missions. He would wait for her answer before speaking again. The whole talking thing again. This individual, Hitomu, freely admitted that he was part of two clans, something that made Jayr flinch inwardly though she showed no sign of it. She hated the lying game, hated hiding that she was in fact part Senju, but she felt it was needed after everything that had happened in her past: after her father had died for that very reason in defense of her. She didn't want her mother to go the same way, and lord knew her mother would dive in front of her in a heartbeat if it meant sparing Jayr's life in exchange for her own. No, she just couldn't risk it - at least not until she knew him a little better. So, she was quite glad when there was a subject change. He mentioned going on a mission, and even though he didn't knew what ranks he was he offered her to tag along. Jayr smiled as she exhaled a fresh hit of her 'medicine'. "That doesn't sound like a bad idea actually. Sure I'll tag along. You're right by the way in your observation: I do have another means to see. Most Yanagi's do. We have sensory through our bodies, mainly our feet, that grows stronger as we do." She didn't mind sharing that bit of information, it was nothing no one taking a trip to a library wouldn't be able to find out. Plus, she at least wanted to offer up some part of the truth even if she was keeping the biggest secret - well, both of them - hidden for the moment. "I don't mind tedious work... Besides, up until now I've had no reason to really be motivated to want to do anything. I guess the new people taking over the village kind of changed that... So, a mission is a good way to start." The tall young man walked through the village streets. 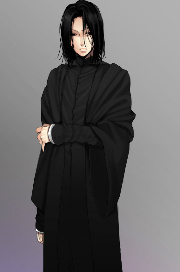 He had a Gothic appearance, dressed completely in black; a long black jacket with diagonal kanji in white on the rear ほこり 熟達 which meant "Dust Mastery." He wore a black body suit which was tight around the torso but baggy around the legs. There were no shoes on his feet, opting to go barefoot. He had shoulder length black hair and a pale complexion that was seeming to darken some now that he wasn't in constant darkness. Kurai, the Harukage, had been doing his best to get the village of Morigakure back up and running properly since taking over the position from Muninn Senju. Next to him was his companion, the 4 foot tall monkey named Little Kong. Since coming to Mori from Kurayami, nothing had been seen of Muninn Senju or Okami Uchiha. Had they deserted? Kurai debated with himself daily over what to do about the two, but there was also the matter of the 2 powerful maniacs out in the wilds. That's if they were even still there to begin with. Kurai didn't exactly have the manpower to send out looking for them at the moment, meaning he would have to go looking for them himself. A half evolved Uchiha and one of the famed rumored extinct Senju, AWOL... this job was troublesome right from the start. Hitomu grinned a bit at her response, agreeing to go on a mission with him. Good, he would definitely find motivation to do important things if he had someone to do them with. She seemed like a nice enough girl. She also mention being a Yanagi, which he had read about in the past. That made her even cooler, at least to him. She then spoke on the new ninja that took over as Kage and his sister who was quite strong from the sounds of it. He smiled at the thought of being able to show his worth. To be someone first choice as a comrade, not a leader. He responded accordingly. "Yea, the new Kage seems to be doing well. I want to show him that I intend on improving every day." He said thinking of his life up until now. He had been treated special, but he really wanted to be treated normal so that he could earn his way into his power. Plus, no one likes the kid that's being groomed for leadership of two clans. That's too much responsibility for them. Of course, he would never admit this out loud, but it was nice to think. It was at that moment that he spotted the actual Kage walking down the street. "Um, not to alarm you, but the Kage is walking by over there." He said surprised how he just happened to be there while they were complimenting him. He didn't want to brown nose either. He probably needed to introduce himself, though there was a chance he might be aware of Hitomu already. Most Kage knew their ninja back and forth after all. He was new though, so he had plenty to do. As he debated it, he would wait for Jayr to respond before doing anything. Maybe she would know what to do. "Should we introduce ourselves?" He asked, not being that socially conscious at this stage of his life. The Kage was walking in their direction? If Jayr focused enough, given how her ability to see was slightly advanced thanks to the duel clans she belonged to, she could just make out Kurai Yanagi moving nearby. This didn't alarm her, though, as she wasn't worried about being caught doing something 'illegal'. In fact, the new Kage already knew the exact reasoning behind her little habit. His twin sister and her mother were working on and off on a new formula that wouldn't make her feel quite so lazy or exhausted due to smoking all day. "He already knows who I am... I was at the Kage Summit when he stepped into power. But, I'll go walk over with you I guess. ", Jayr said thoughtfully as she quickly emptied out her pipe and put it and her lighter back into the little pouch she carried them in. They were slipped back into her bag whose strap was tugged up and over her shoulder so it was laying across her chest at an angle. She stood up, toes wiggling a bit at the sudden feel of blood and pressure on them. Thankfully the grass was cool beneath her feet as she took a few steps forward and then stretched skyward: she had been in the same position for quite a while after all. "Okay, let's go...", she would say in a calm and mellow voice once her stretching was done. One of the masked village ninja dropped down from above to land in a crouch nearby himself and Little Kong. One of the few he could actually have out looking around. Yet these weren't exactly built to confront or apprehend any of them; they were just eyes. "Morikage," he said. "What have you found?" Kurai asked. "Anything?" "There's no sign of Okami Uchiha or Muninn Senju. My men are continuing the search. We also searched the area you mentioned, there were no signs of a man and a child. We'll continue to look and inform you of our progress at regular intervals." "Hmmmmh..." Kurai had been frowning a lot more lately; the head of a village was a stressful job. Especially the head of a village that had 2 troublemakers, and 2 maniacs hiding out in the wilderness. All of which seemed to have just vanished into thin air. "...Well, no news is good news, I suppose... Thank you. Keep your eyes open." The ninja nodded his head and leapt out of sight again. Kurai rubbed the top of Little Kong's head. "How about it Little Kong, you want the hat instead of me? Go looking for all of these psychos and morons?" he asked, and Little Kong made a scoffing noise. "I thought so..."
She responded, stating that they were already acquainted. Hitomu's facial expression of surprise was not one could hide, even if she could not see it. She went a Kage Summit? Was she really that powerful? Oh they definitely had to be friend now. "Wow, that's pretty cool." He had to show his admiration. Part of him was a little jealous if he was being honest, but he would never be mean or rude to her. He feared losing her potential friendship too much. Jayr got up after putting her medical stuff up. She would get up, stretching out her muscles. He decided to get up and do the same, as it was always a good idea to stretch. She then stated it was time to go, to which he responded. "Thanks for introducing me, by the way." He said before the moved forward to approach the man. As they got closer, Hitomu noticed a small companion with him. It seemed to be some kind of prime ape, but he was far from an expert in pets. He would be sure to acknowledge it when he got to talk, as it was probably ignored at times. The man himself had similar look to Hitomu, just a bit more mature. If Hitomu was honest, he was a bit nervous, but he just hoped it didn't show. Once they got close enough, he was sure the Kage was aware of their approach, he would simply bow respectfully to the man and his companion. "Lord Kage, his friend." He wanted to show he had some sense in his head and wanted nothing but good things for this village. Maybe then, the Kage would see the potential that everyone was so convinced he had. Jayr saw a masked individual drop down near Kurai, though the words spoken were ones she couldn't hear. She figured that whatever it was it had to be important, and she hoped that no trouble was about to start up with the village. There were already rumors spreading around at the cannibals, though no one had seen them, as well as the fact that Munnin had been out of sight since their arrival back home - though clearly not out of mind with those spreading the gossip around. Jayr was rather calm as they finished approaching Kurai and Little Kong, though she could tell that Hitomu wasn't. She had a feeling it had something to do with how powerful Kurai was, or perhaps the position he now held within the village. Jayr likely would have felt the same way were she not as calm and mellow as she was due to the Chill. Still, Jayr bowed respectfully, a grin on her face, as she listened to Hitomu say hello. Deciding to help she nodded toward her new friend before 'looking' at their kage and his friend. "This is Hitomu; of the Nara and Funen clan." Jayr approached with someone he'd seen around, but didn't know who he was. Kurai could have dug up his faile back in the office, but there was this matter with Okami, Muninn, and the 2 maniacs out in the woods. With everything he'd been doing to look for all of these morons, he hadn't even taken the time to see who he had in the village in terms of ninja. Jayr introduced him as Hitomu of the Nara and Funen clans. Both of them bowed to him and Little Kong, with Hitomu addressing him as lord. "Ehhh," Kurai mumbled, waving his hands. "No need for all of that, i'm no lord. I'm not real big on formalities... I can't be much older than both of you." Kurai pushed hair out of his face. "My name is Kurai Yanagi. I'm the Harukage here, but it's only for the moment. You see, i'm really from Kurayamigakure... This is my partner Little Kong. He understands English, so please mind what you say to or about him." Little Kong waved to them both. "I've been meaning to tour the village to meet people and potential shinobi, but there's a couple of situations going on..."
Kurai rubbed his eyes with an index finger and thumb. "We have 2 shinobi currently AWOL. One of them is the former Harukage... I was sent here to help him out, refine him... There are 2 powerful maniacs out in the wilderness somewhere... the former Harukage had one of his arms pulled off by one of the maniacs. Its currently a sketchy situation... But you needn't worry though. Little Kong here will protect all of us." Little Kong made another scoffing noise. "...Anyway... if there's anything I can do to assist you two in some way, please don't hesitate to ask..."
The man spoke, stating that there was no need to be so formal, it wasn't his preference. Hitomu understood, as he could see how it could be awkward. He commented on his age, to which Hitomu took a closer look. He seemed young, so he was probably right. He introduced himself as Kurai Yagani. Apparently he was only temporary Kage and explained why. He didn't know about the maniacs that were running around, which made him a tad nervous. He made a mental note to stay out of the wilderness unless he was accompanied. If they could rip the arms off of a Kage, he didn't stand a chance. Not to mention the former Harukage was missing, so that added to the potential disaster. He was just glad there was someone here that was confident enough to protect them from the danger. Little Kong was the name of his companion, which he liked that name. The Harukage then offered his assistance in case they needed something, to which Hitomu smiled. To be someone with so much power, humility and kindness were a breathe of fresh air. Usually, at least in the world of Shinobi, arrogance followed great power. "Thanks. I'm honestly just looking for more shinobi to train and do things with. Nice to meet you though, Kurai and Little Kong. I didn't expect the kage to be quite so nice." He said being honest with the man. This was someone Hitomu could get behind. However, if he was only temporary that meant he was looking for a replacement. That saddened the Genin a bit, but there was a chance that the next one would be just as pleasant. He decided to let Jayr speak, considering she knew the man already. Kurai waved his hands, saying that there was no need for such formalities. Jayr straightened up and simply grinned: that was cool points in her book. She didn't mind showing respect, but she also didn't like it when it was demanded of her. That made Kurai pretty cool. She listened as Kurai introduced himself as a Yanagi, mentioning his position, and how he was originally from Kurayamigakure. He introduced the monkey with him as Little Kong, and mentioned that he could understand everything they were saying. He added that he had been meaning to tour the village but had been dealing with some problems, which caused Jayr to frown. There were two maniacs running around who hadn't been seen or heard from in some time, maniacs who had attacked the previous kage named Munnin. It was the former Kage who was one of the ninja who were missing at that moment. When Kurai mentioned for them not to worry, and that little Kong would protect them, she smiled: she highly expected Little Kong to be capable of just that - Ninja companions were exceptionally strong in their own right when taken care of, and Little Kong looked like him and Kurai made a good team. She remained silent while Hitomu spoke, nodding her head in agreement when he mentioned Kurai being nice. "I've been kind of looking for someone to train with and under, too. My mom says that she and your sister Hikari are close to perfecting a formula for my 'medicine' that won't make me so tired and foggy, so I'll be able to do stuff more easily." Jayr then bit her lower lip, contemplating a question which had been burning at her for a while. "Um.. if you don't mind me asking... Is it true that the former kage lost his arm to one of those maniacs you had mentioned? I keep hearing different things, so I'd like to know the truth rather than trying to believe a rumor. Some people say they jumped him, and some others are saying he started messing with them first..." She would understand if Kurai didn't want to tell her, especially if it was official important information for the village, she was a ninja after all so she knew the need for secrecy. But, she also wanted the truth rather than going off of what a rumor said. "Heh... i'm not really a Kage per se... My sister and me, you might say we learned things a little faster than most... I wouldn't mind passing along some of my knowledge before a more permanent Harukage is put in place," Kurai said in response to Hitomu. "Though if you ask me, Little Kong here would be a better teacher than I would. He'd mop the floor with me nowadays." Given the situation of things, Kurai still tried to crack a joke or two, even if Little Kong scoffed and frowned. Jayr said that her mother had been working with his sister to make a calming agent that wouldn't have her down and groggy, and to this he nodded her head. At her next question, Kurai simply rubbed his eyes with his fingers while sighing. The whole situation was out in the open now, especially with the scene that Muninn made after he was attacked - bleeding his Senju blood everywhere - so there was no use hiding it. "...Muninn Senju initiated the whole thing," Kurai responded. "The way it was told to me, the 2 maniacs were pretty far away from the village, out in the deep forest, and trackers that investigated the scene of the attack tell me based on their movement patterns that they weren't headed in this direction, so it seems like they were trying to keep their distance. Muninn intruded upon them, so my guess is they were forced to defend themselves." Kurai didn't want to spread panic. "...You two shouldn't worry though. If anyone attacks the village we'll defend it." An aura appeared surrounding Kurai for a split second, long enough for them to catch a glimpse of a large bull, appearing to hold a hammer. A breeze was created, bending the grass and pushing the trees surrounding them. Jayr spoke up, mentioning something about medicine. Was she sick? Was there anything he could do? This is stuff he would find out later, he just couldn't help being curious about it. She then asked about the details of what happened with the insane people in the forest. This was something the whole village was talking about, and he had heard several different versions. He would be glad to know the truth as well. Kurai then spoke, noting that he wasn't the permanent Kage, but he wouldn't mind teaching someone a few things. Would the kage of his village teach someone like Hitomu? It wouldn't hurt to bring it up later, but for now he wanted to listen to what the man had to say. He seemed to like joking at Little Kong, who didn't seem to be interested in making light of his ability. Ther relationship was interesting, as was both of them in general. He then answered her question, setting his mind at ease. Apparently, the former Kage was trying to stir up trouble and got his arm ripped off. Hitomu didn't see the point of actively going to look for trouble. In the shinobi world, trouble was abundant. Kurai went on to mention they should worry, that they would defend it. At first, he assumed the man meant himself and Little Kong, but he was soon corrected. An aura around the Kage, showing the form of a mighty bull. It soon disappeared, obviously powerful and brought up even more questions. Hold on a second, was that a bijuu? The man in front of him really was on a different level of strength. A level Hitomu wanted to one day join. "Oh wow, if that is what I think it is, you really are strong. I'm glad you are here helping us, but I hope you don't get too home sick. I would love to learn from you before you leave!" He said making sure to include his willingness to learn. His goal was to be an Anbu and to protect someone like Kurai, so who better to learn from than an actual Kage? Kurai explained the situation and it was definitely an interesting story. The previous Harukage had picked a fight with two lunatics out in the wild. He had had no reason to be there from the sounds of things, but had decided to go looking for trouble. He had lost an arm considering the rumors going around, and chances were he was lucky that that was all he had lost. Jayr just shook her head a bit - why would anyone want to pick a fight with two maniacs who had been minding their own business? Kurai told them not to worry though, that if the lunatics came into the village they would be well protected. Jayr didn't doubt this for a moment. An aura then appeared around Kurai that looked like a large bull. What in the world? Had that come from inside of Kurai? The only thing Jayr could think of that would be able to do something like that was a chakra beast... or a bijuu. Did Kurai have a bijuu sealed inside of him? If so, he was even more dangerous than she originally thought. "Whoa, cool." Hitomu said he still wanted to learn from Kurai, and Jayr nodded her head in agreement. She had a feeling there was a lot she could learn from Kurai, and she was willing to put in the hard work to do just that.